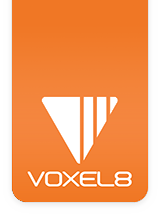 Below are some basic troubleshooting gcodes for advanced users who understand and want to issue low level commands to the Voxel8 Developer's Kit. GCodes can be issued through the OctoPrint user interface within the Control Interface (see Pictures 001, 002, 003). Picture 001: The commands area in Control Interface where gcodes are entered. Once the commands tab is open, there are a few different areas, including the "B" where the gcode command is entered and "C" the submission button for it (see Pocture 002). Clicking on area "A" will bring up the status message window which can be scrolled (see Picture 004). A custom gcode to "home all" is entered (see Picture 003). Picture 003: Home all gcode submitted to the Developer's Kit Printer for execution. Picture 004: The scrollable status of the machine after submitting gcode. NOTE: You should only submit gcode to the Developer's Kit printer if you are sure of what it will it will do.